A Holocaust Survivor, Spared From Gas Chamber By Twist Of Fate : Parallels The line on the left went to Auschwitz, but an SS guard shoved Jack Mandelbaum to the right. Thus began a three-year nightmare in seven labor camps for a Jewish teenager who refused to give up hope. 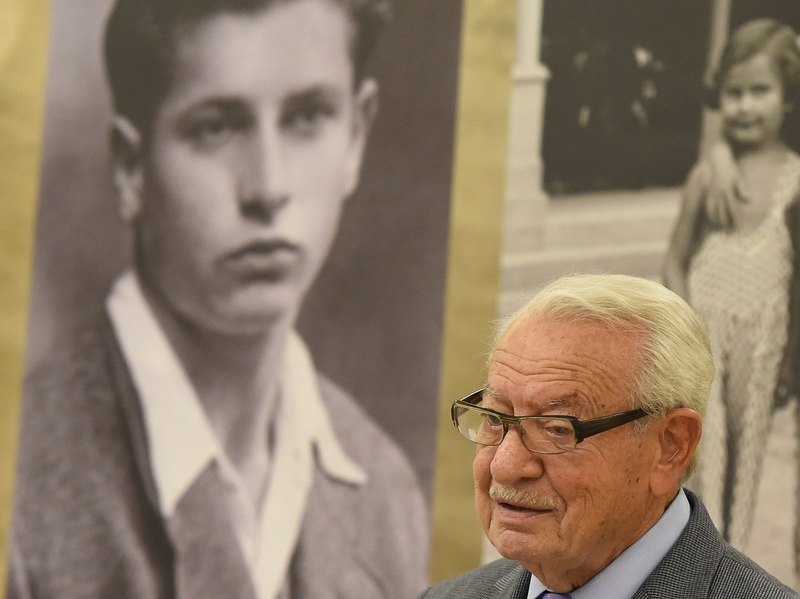 Jack Mandelbaum, a Holocaust survivor from the Polish city of Gdynia, poses in front of a photograph showing him as a youth. "I'm a person of action," he says. "Anger doesn't get you anyplace. Hate doesn't get you anyplace." "I guess he didn't want us to worry about him, so he said he was OK," Mandelbaum says. "They banged on the door and everyone had to come out in five minutes, and there was a lot of shooting and crying, and people didn't know what was happening because they had to rush out," Mandelbaum recalls. "Many people were even in their bed clothes. And we were lined up in the market square, and then we were marched to a local brewery." An SS officer there began separating people to the left and to the right. Mandelbaum says he clung to his mother and brother, who were sent to the left. But the SS officer saw in his documents that Mandelbaum had worked as an electrician's helper. "He grabbed me and pushed me to the other side," Mandelbaum says. As for his family, he says, "The people who were to the left were sent to Auschwitz to be gassed. I never saw them again." "There were so many prisoners," he says. "We were in a big barrack, it had a concrete floor, it had no beds. And we were lined up like herring on the floor, so when one person turned, everybody else had to turn, it was so tight." He recalls emaciated prisoners stuffing paper into their mouths to fatten their cheeks so they'd look healthier to the guards assigned to remove the weak for extermination. His own weight eventually dropped to 80 pounds. "We had a good life before the war. I went to a public school, I had good clothes and good food and a nice apartment," he says. "My dream was to go back to this life and be reunited with my family and my sister and my brother, and that sustained me." It also helped that he didn't know the Nazis were trying to slaughter all Jews, something he says he and other prisoners learned only after liberation. Their sudden freedom, too, was a complete shock, Mandelbaum says. "We didn't know anything, only on the morning when we woke up and the Nazi flag wasn't flying and the guards weren't there." Unlike at Auschwitz, Allied soldiers did not free them, as his camp was in a no man's land between the fleeing Nazis and advancing Russians. He and a friend from the camp grabbed an abandoned horse-drawn wagon and left as quickly as they could. "We came across a women's concentration camp and they were still locked up, so we actually became the 'liberators' of the camp," he says, with a laugh. The following year, he immigrated to the United States and settled in Kansas City, Mo., where he married, had four children and became a successful importer of ladies' handbags. It would be 16 years before he began speaking publicly about the Holocaust, something he says he decided to do after talking to one of his neighbors. "He asked me what kind of sports did I play in the concentration camp, so all of the sudden it just opened everything up, how little people knew what was going on, and this was when I started to speak in different venues about my experiences," he says. That desire to educate people brought Mandelbaum, 87, to Berlin last week. He says it's sad to see anti-Semitism on the rise in Germany and elsewhere in Europe, but he hopes he and other Holocaust survivors can make a difference. "You know, when we were in the camps, we would always ask, 'How can the world stand by and let this happen?' " he says. "So it's a matter of being vigilant, a matter of trying to do as much as you can in order to enlighten people [about] how dangerous it is when you become a bystander."